This is Part 1 of a six-part series that tells the story of humankind’s efforts to understand the origins of life, by looking for it in extreme environments where life thrives without relying on the sun as an energy source. This series follows an oceanographic expedition to the Mid-Cayman Rise, led by Chris German of the Woods Hole Oceanographic Institution, and NASA’s efforts to plan a future mission to Jupiter’s moon Europa. By understanding how life can survive without the sun, we may discover how life began on our planet, and whether or not Earth is the only place in the universe capable of supporting a biosphere. On Feb. 17, 1977, Tjeerd van Andel of Stanford University and Jack Corliss of Oregon State took a few last breaths of the South Pacific air before closing the basketball-hoop-size hatch of the research submersible, Alvin. Their pilot, Jack Donnelly, then guided the 23-foot-long (7 meters) craft down 9,000 feet (2,740 m) toward the seafloor, away from the team’s research vessel Knorrand mother ship, Lulu. Ninety minutes later, the trio reached the bottom. Six hours and 47 minutes later, they were back at the surface. When the science team extracted the first water samples taken from the seafloor, the entire lab on the Knorr was filled with a horrible stench: rotten eggs. Six months later, on Aug. 20, 1977, NASA's Voyager 2probe launched into space aboard a Titan IIIE/Centaur rocket from Cape Canaveral, Fla. The spacecraft sent back its first photos of Jupiter after 20 months in transit to the gas giant and after another 2 1/2 months, it flew to within about 125,000 miles (200,000 km) of Europa — one of Jupiter’s 64 known moons. As raw images beamed back to Earth at a rate of one every 90 seconds, scientists, engineers, students and journalists sat glued to their seats staring at stunning images that revealed a white, icy world, criss-crossed with dark lines and a surface seemingly as smooth as anything thus far seen in our solar system. Images and data received from Voyager 2 suggested that beneath that layer of water ice lies a liquid water ocean bigger than all of Earth’s oceans combined covering the entire moon — which is itself about the same size as our own moon. 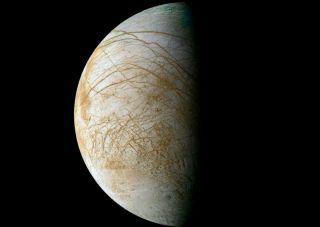 Soon researchers began to wonder if, beneath that layer of ice at the bottom of thousands of feet of water and methane liquid, the seafloor of Europa smells like rotten eggs, too. At first glance, space and sea might seem like opposite ends of a spectrum that defines extremely hazardous environments to life — or hazardous to our kind of life,at least. In space, there’s no air to breathe and thus no air pressure to hold our skin and organs in place, maintain water in our bodies as a liquid versus a vapor, and keep oxygen circulating in our blood. A human can die within several seconds of exposure to the vacuum of space. In the oceans, an equally deadly environment exists, though at pressures up to several thousand times higher than what we’re used to — pressures that would crush us without the protection of a submarine or deep diving suit. But space and oceans share a lot in common. They’re both vast, almost entirely unexplored regions compared to tiny us. And both have a lot to tell us about life. The fact that life exists in the first place is rather incredible. Life could have very easily not existed. We haven’t yet found evidence for past or current life on any of the planets and moons in our solar system. We haven’t begun to scratch the surface on whether life exists outside our solar system, but we haven’t found it anywhere out there yet. Chris German is in the business of exploring some of Earth’s more hellish environments. A geochemist at Woods Hole Oceanographic Institution in Massachusetts, German leads research expeditions aimed at understanding the complex plate tectonics and chemical reactions taking place on Earth’s seafloors. By discovering the history of the planet’s shifting seafloor, he’s uncovering knowledge of the nature of extreme environments — the kind where life probably shouldn’t exist, but does. At 8:00 a.m. on Jan. 6, 2012, German began perhaps the most promising research expedition of his 28-year career. He watched from the deck of the research vessel Atlantisas his team and crew totaling nearly 50 people embarked from Port Everglades, Fla. The last shipment of equipment had only narrowly arrived with half an hour to spare before the ship’s departure, culminating years of preparations for this expedition. Atlantisheaded south, passed the Florida Keys in the late afternoon, and turned west, following a backwards S route that would take the team around the western end of Cuba to a stretch of ocean above a 70-mile-long (113 km) ridge in the seafloor called the Mid-Cayman Rise (MCR). Their target: new hydrothermal vent sites along the ridge that German and colleagues had explored and mapped during two prior survey expeditions in 2009 and 2011. Dubbed "OASES 2012: Return to the Cayman Rise," this research expedition was chronicled by Julia DeMarines, a research assistant of the astrobiology curator at the Denver Museum of Nature and Science. Hydrothermal vents occur where near-freezing water at the bottom of the ocean meets the scalding hot rocks of young ocean crust. At mid-ocean ridges like the Cayman Rise, magma is produced by a heat source that comes from energy released from the decay of radioactive materials deep inside the planet and also leftover heat from the Earth’s formation. When water and hot rocks meet, the now superheated water shoots up through cracks in the seafloor, creating plumes of hot gases and chemicals that can reach several hundred feet in height. The plumes are often black and sooty — the ocean version of a diesel train engine belching a steady stream of black smoke into the sky. This gives rise to the nickname black smoker. This mix of hot chemical-laden fluids and cold seawater creates conditions that form the ocean equivalent of a desert oasis. The research submarine Alvin reaches with its mechanical arm to a high-temperature black smoker at the Endeavour Segment, Juan de Fuca Ridge, to study methanogenic microbes. These sites host communities of living matter that can be denser than any patch of life on land in the known biosphere and 10,000 to 100,000 times greater than the rest of the seafloor. Here, exotic tendril-like organisms called tubeworms can grow 8 feet tall (2.4 m) and clams can be 1 foot (0.3 m) across. This is remarkable given that the pace of life on the bottom of most of the ocean is slooooow. Once, in 1968, the Alvin submersible sank to a depth of 5,000 feet (1,520 m) after a cable attaching it to its mother ship snapped as the vessel was being lowered into the water. The three-person crew was able to scramble to safety, but they forgot to grab their bag lunches: three apples and three bologna sandwiches. These sat on the ocean floor for 10 months before a rescue crew was able to recover Alvin. Upon finding the lunches, the crew was amazed at how little they had changed—some even tasted the sandwiches. Salty, but fine, they said. It was as if the biological process of degradation had simply stood still. Yet life thrives at hydrothermal vents. They’re also diverse by location, just like distinct biogeographic regions on land. Lifeforms found in one ocean can vary significantly from those found in another ocean. The 2011 cruise had been especially productive in proving the amazing diversity of life near these extraordinary sites. German had personally witnessed the discovery of the first live tubeworm found near a hydrothermal vent in the Atlantic Ocean. Built as the world's first deep-ocean submersible, Alvin has made more than 4,200 dives and can reach 63 percent of the global ocean floor (reaching depths of 14,764 feet/4,500 meters). The MCR is home to the deepest known underwater volcano in the world and is unique among the world’s 42,000 miles (67,600 km) of ocean ridges for its geologic diversity. "In a nutshell, it displays perhaps the broadest range of mid-ocean ridge geologic processes all active in the same place," German said. The ridge is considered an "ultraslow" spreading ocean ridge, meaning it moves at a rate of less than an inch a year, as compared to the relatively speedy "slow" spreading ridges which move at just under 2 inches a year or "fast" spreading ridges which have been clocked at a blazing 8 inches a year. The site is the home of three different types of vents, which are classified by their temperature and the chemical composition of the rocks that give life its fuel. The first, Type 1, is common throughout the world’s mid-ocean ridge system and is characterized by high temperatures (sometimes more than 750 degrees Fahreheit, or 400 degrees Celsius) and "mafic" rocks from the Earth’s crust, meaning they are rich in magnesium and iron. Type 2 vents have similar high temperatures, but these vents are the result of reactions between seawater and far deeper rocks from the Earth’s mantle with even higher concentrations of magnesium and iron. These are classified as "ultramafic." Type 3 vents, too, are ultramafic but have much lower temperatures. Since they’re hosted in rocks formed at even higher temperatures than what erupts at the seafloor today, they are directly comparable to material that erupted on the early Earth. As such, ultramafic vent sites are among the most exotic and captivating of hydrothermal environments to marine scientists. Chief scientist German had found evidence for at least three vent sites during his first trip to the MCR in 2009. Past experience in the southern Indian and Arctic oceans had tempered expectations for discovery of new vent sites to no more than roughly one site for every 100 miles (160 km) of mid-ocean ridge explored. Since the MCR was only 70 miles (113 km) long, that first voyage was "probably the highest-risk expedition I have ever undertaken," says German. The probability of finding even one vent site there was fairly low to begin with. Thus, finding three sets of plume signals in those original water-column studies, indicative of three different types of venting on the same relatively small stretch of mid-ocean ridge was astounding, a bit like looking for a coffee shop and finding a Starbuck’s, a Dunkin' Donuts and a Caribou Coffee on three corners of an intersection of a two-road town in the middle of a Nebraska cornfield. That’s why, in the world of hydrothermal vents, there’s more than one reason why this specific stretch of seafloor real estate is considered a "hot spot." Unfortunately, the team’s original discovery was followed closely by setback. The 2009 expedition was cut short by a tropical storm before the team could get up close to any of the prospective sites with its Remotely Operated Vehicle (ROV), Nereus. German had to wait until the 2011 opportunity to get a closer look, but this 10-day expedition was only intended to photograph and map the vent sites. No samples were collected. Both expeditions paved the way for the 2012 expedition, which would be the first to study each site in detail and to obtain actual samples of the rocks, water, tubeworms and other critters in the vent communities. German hopes that the samples from these wildly diverse vents, all within a small patch of mid-ocean ridge, will reveal secrets about the formation of the early Earth, and maybe while they’re at it, the origin of life itself. By studying how a living ecosystem can sustain itself in the deep, black ocean, far below the reach of the sun’s rays, German isn’t just classifying exotic worms and other animals in a quirky "Twilight Zone" setting — he’s looking through time. "Just like the Hubble Telescope, pointed at the most distant points of the Universe, hydrothermal sites like these may become a sort of lens that allows us to view back into Earth’s distant past and explain how life originated on Earth," German said. And just like the Hubble Space Telescope, his expedition is funded significantly by the agency largely responsible for directing our eyes skyward: NASA.